Accomplishments for the week: I am working toward a few personal / professional goals that aren't quiet flushed out enough yet to share - but I have made a few big strides towards achieving them this week. Sorry I can't share more yet. Stay tuned. In other accomplishments, I worked on my closet cleaning and baby boys room as well as cleaned up the guest room. Priorities for next week: My priorities for next week are networking (already have a few things scheduled,) continue to work on baby boy's nursery and work on a few recipes to share on the blog! Schedule / to-do list for next week: I'll work on my schedule and to-do list this afternoon. It will include more details on how I'm going to work on my priorities listed above, as well as specific to-do items for both work and home life. Including concentrating on Father's Day gifts and plans! Downtime for next week: I am going to commit to two nights of early bed times next week. This won't be hard since I am hitting the part of my pregnancy where I am really tired. Organize office: Since my home office is in transition (we are converting our "office room" into the nursery and moving my desk into our bedroom - the organizing my office is difficult. But, I have been working on this project all week - so for now that is going to have to do. Decide weekend accessibility: I have some weekend responsibilities, so I do check my work email / phone but nothing gets a response unless it is urgent. That is pretty standard for my weekend accessibility. Weekend plans: Activities for the weekend may include the Soul Food Farm Vintage Market, a trip to Effie Yeaw / Ancil Hoffman park and a "Day at the Farm" event in Newcastle. Plus loads of eating, music and playing scrabble. It's always fun to have visitors! Fun Friday activity: Since our visitors arrive today we will fun Friday evening no matter what... maybe Pangaea Two Brews Cafe for dinner and a stop at Gunther's afterwards? Ice cream has to go on the list since this weekend is going to be so hot! Acknowledge others: What a good idea. I know in both my personal life and work life -- there is so much that I couldn't get done without the help of others. It's not hard to take a few minutes and say thanks. My husband would be first on this list for being so supportive. Especially through my crazy preggo hormones. Say "good-bye": I try and do this every week -- but today I'll make it a priority. 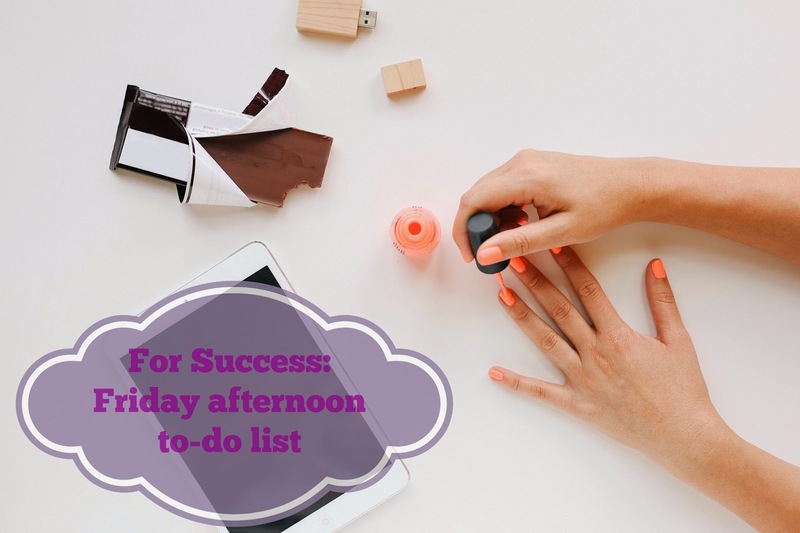 I can see how its important to wrap up your week and it provides opportunities to connect with people that might have been busy all week and unavailable. *PicMonkey link is an affiliate link.